Grande maison pour les vacances en famille et le festival du film de Telluride. 5 jours à 1 mois. 4 chambres (7 personnes) / 3 salles de bain situées sur un coin de rue à seulement un pâté de maisons du centre historique de la rue principale de Telluride (Colorado Ave). 2-3 pâtés de maisons de plus d'une douzaine de restaurants / bars, de dizaines de magasins de détail, du cinéma, d'une épicerie et d'un magasin de crème glacée. Lieux du festival: Théâtre Herzog 5 pâtés de maisons. Mason's Hall 2 pâtés de maisons. Nugget Theatre 2 pâtés de maisons. Opéra Sheridan 3 pâtés de maisons. Théâtre Galaxy 4 pâtés de maisons. Palm Theatre 7 pâtés de maisons. Gondole à Mt Village 5 pâtés de maisons. A 5 pâtés à la libre 11 min. Télécabine pour l'accès au village de montagne. Grande cour privée avec bain à remous extérieur. Toute nouvelle cuisine. Sur le Sunnyside privilégié de la ville le salon / salle / cuisine de vie a 11 'plafonds avec de superbes vues et des tonnes de soleil. WIFI et TV à écran plat. Les maîtres et 2 chambres chambres ont chacune lits queen plus twin en 4ème chambre. La salle de télévision (60 "à écran plat) est adjacent à une reine et chambre à deux lits. Il y a une grande terrasse située à côté du salon. Stationnement hors rue. Grande cour arrière privée avec bain à remous, table, chaises et parasol. Une caractéristique unique à Telluride !! I hosted my daughters and son-in-laws for a week in this home. The location is perfect and the home is simply great. I would highly recommend it to anyone desiring the best Telluride location and amenities. Thanks Joe. I'm glad you had a great time in Telluride. We rented the house for a family ski trip - 2 adults and 3 children. Great location in town. Five minute walk to free gondola and one block away from restaurants, stores, etc. The house is in very good condition, great light and air and plenty of space for our family. Kitchen and bathrooms are high quality, comfortable beds, and plenty of towels. The family really enjoyed the outdoor hot tub, which is well maintained. Would definitely recommend this house and hopefully we will be back! Jason-Thanks for your nice review. We rented this house for our holiday snowboarding trip. 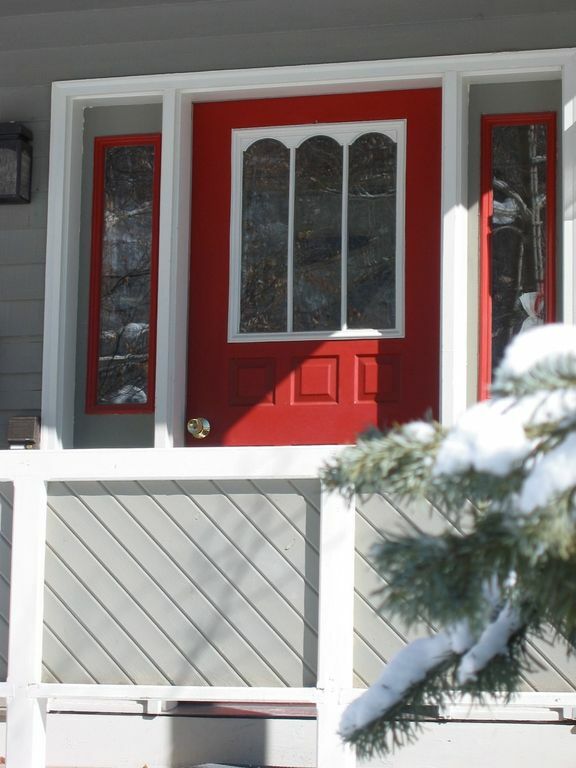 Great location - one block from downtown, short walk to gondola. Great light in the house, bedrooms perfect for our crew. House is in fantastic shape. Parked our truck in the driveway and rarely had to use it again. Super easy working with the owners. We loved this house - hope to make another trip to Telluride and stay there soon. Thanks for being great guests and taking such good care of our home. We enjoyed the 2015 Bluegrass Week in this lovely home, which easily and conveniently accommodated our party of 7 from Towson, MD. Located on a quiet street, yet so easy to get to anywhere quickly. We took advantage of the nearby trails, restaurants, and music venues. We parked the cars and never used them the entire time we were here. The house is beautifully maintained - and communication with the owner is very easy. We certainly plan to come back again with our grown children in the next year or two - every year would be ideal! This is a beautiful, comfortable well appointed home that I'm looking forward to returning to next year! The location is the best in town, and it is perfect for a family vacation. What could be better than to be in Telluride with all of the summer activities and the extraordinary setting.